On warm spring nights in some rare spots in Wales, a rasping, throaty call bubbles from within the sand dunes, carrying on the evening breeze for several kilometres. Follow the noise and a small toad is at the source of this raucous warbling. The bold, thin racer stripe down its warty back distinguishes it from the common toad – it is a natterjack. During the spring mating season, males come together and sing lustily in groups to attract a female. To see or hear the natterjack toad (Epidalea calamita) is becoming increasingly rare in Britain, and it has the dubious accolade of Wales’ rarest amphibian. They are slightly smaller than the common toad and, aside from their dorsal stripe, have a distinctive running gait due to their shorter legs, which also means they are unable to jump or hop. Their former scientific name Bufo calamita means ‘running toad’. Surprisingly, they are poor swimmers and are most likely to be found in salt marshes, sand dunes and lowland heaths with shallow ponds and sandy soils. They dig burrows into sandy soils, and day finds them resting in the entrances of these, ready to retreat deeper should a predator such as a heron, weasel or crow come along. Should they be caught unawares away from their burrow, they can run at surprising speeds and can also secret a poisonous liquid from their skin that helps them evade the jaws of their predators. Natterjacks feed on invertebrates such as moths and spiders and their tadpoles feed on algae. They are nocturnal, and are aggressive hunters. They use their unique running gait to chase after their prey, snaring them with a sticky flick of their long tongue. 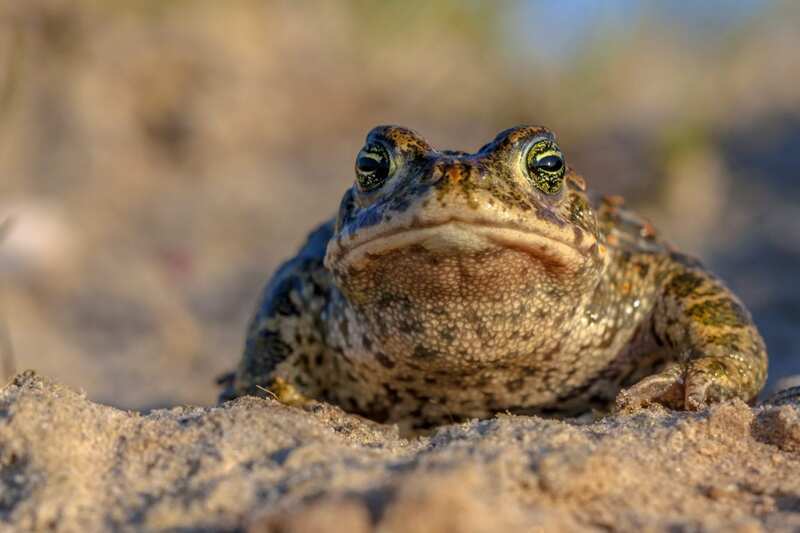 Natterjacks can live for up to fifteen years and between April and July they spawn a single row of eggs (as oppose to the common toad’s double row). The pools need to be shallow and have gently sloping banks. The nature of such pools means that tadpoles often perish when such pools dry out in the summer sun. To compensate for this, natterjacks mate for an extended period. However, the measures they take for their survival pale in face of the challenges this species faces. There are very few natterjack toad colonies in Wales, restricted to the north-east. They are scattered throughout the rest of the UK and Ireland, with notable populations in Merseyside, Cumbria and Scotland. Their numbers are decreasing in wider Europe too, despite being protected under the Conservation of Habitats and Species Regulations 2017. Loss of habitat is the main reason for their decline, which is due to human urban growth, loss of lowland heath, loss of habitable coastland and acidification of aquatic habitats. Natterjacks are our noisiest amphibians, yet Welsh legend tells of an even rarer, even nosier toad that roams the watery corners of Wales. Llamhigyn y Dŵr, or the Water Leaper, is a giant frog with bat wings instead of front legs, a long serpentine tail instead of back legs and a piercing, deadly shriek that immobilises its victims, be they lost sheep or unfortunate fishermen. Llamhigyn y Dŵr isn’t Wales’ only deadly toad. Gerald of Wales chronicles in Itinerarium Cambriae (Journey through Wales) the story of a young man who was pursued and eventually eaten alive by a plague of flesh-eating toads. Tales like this contribute to the strange folklore surrounding toads, which links them with witchcraft, misfortune and pestilence. In reality, of course, toads are completely harmless. So if you do hear the call of a natterjack late on a spring eve, do not hesitate to try and catch a glimpse of this rare creature. If their decline continues unchecked, this chance may not be around for much longer.